Are they, or are they not, awesome!? Because of my stoopid foot I couldn't find anything to fit that was pretty. So I made the pair for me and posted about them here. To recap, I managed to get a pair of Italian leather Carvela shoes for one pound - I don't have a problem with second hand shoes as long as they are immaculate and I'll be wearing socks/tights etc. However, once I decorated mine, I thought how fab it would be for the 3 oldsmaids to have shoes that complemented mine. I bought them the same style shoe from Everything for Five Pound - or something like that LOL! They started off as tan suede shoes. They really needed to be court shoes and to match for the finished effect. 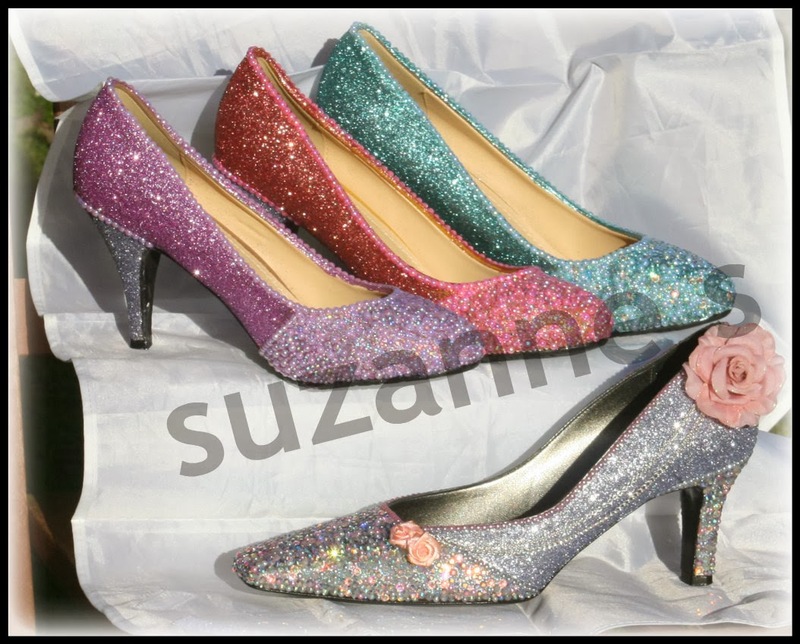 The heels are they same gunmetal silver glitter as the main body on my shoes and then the shoes were firstly glittered the three colours - pink, lilac and blue - and then I added matching gems at the front, the same pattern as mine :) Not bad hey? I wish I wore shoes because I'd totally do this to them. But I own one pair of shoes and one pair of sneakers. That's it. beautiful shoes. You're very creative. Wow! I can't believe those started out as plain suede. They're amazing. You really have a talent for sprucing up shoes. Wow, I can't believe you made them! Wonderful.